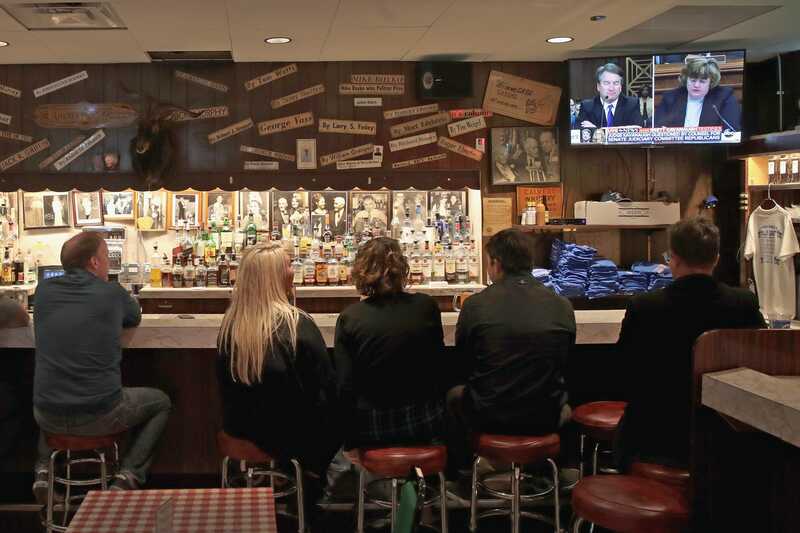 Scott Olson/Getty ImagesCHICAGO, IL – SEPTEMBER 27: Patrons watch as the television at the Billy Goat Tavern plays live the Senate Judiciary Committee hearing on Capitol Hill where professor Christine Blasey Ford and Supreme Court nominee Brett Kavanaugh were testifying on September 27, 2018 in Chicago, Illinois. Americans over the age of 50 are worse at differentiating facts from opinions than younger ones, according to findings from a Pew Research Center study. Researchers gave participants ten statements, five of which were facts, and five others that were opinions. The results showed that 32% of the people aged 18 to 49 who were surveyed correctly identified factual statements as facts. Just 20% of respondents aged 50 and older correctly identified the factual statements. When given a list of opinion statements, 44% of those in the 18 to 49 age group correctly identified the opinions, while only 26% of those aged 50 and older did so. Skipping a statement counted as incorrectly identifying the fact or opinion. The revelations from this study are consequential for multiple reasons, including that millennials, classified as people born between 1980 and 2000, currently outnumber baby boomers, who were born between 1946 and 1964. Next year, the number of millennials who are old enough to vote is expected to surpass that of baby boomers as well. Researchers gave participants ten statements, five of which were facts, and five others that were opinions. The results showed that 32% of the people aged 18 to 49 who were surveyed correctly identified factual statements as facts. Just 20% of respondents aged 50 and older correctly identified the factual statements. When given a list of opinion statements, 44% of those in the 18 to 49 age group correctly identified the opinions, while only 26% of those aged 50 and older did so. Skipping a statement counted as incorrectly identifying the fact or opinion, the study said. The study comes as Americans are increasingly bombarded with content that blurs the line between fact and opinion – and, in some case, fact and fiction. These revelations are significant for other reasons as well. The number of voting-age millennials is quickly approaching that of baby boomers. As of November 2016, the Pew Research Center found there were 62 million millennials eligible to vote in the US compared to 70 million baby boomers.